Last weekend we noticed supplies were running dangerously low. As in empty wine fridge low. Vodka and no tonic, Manhattans without the vermouth. It was desperate times around here at C&G HQ. Lucky for us in Maine you can buy your booze right alongside your bread at the local grocery store. We have some strange importing laws (the price for that purchasing freedom) so most places carry all the same ordinary wines. Bow Street Market in Freeport has a very knowledgable wine buyer, so when we're looking for variety (and large quantities) that's where we'll head to re-stock. 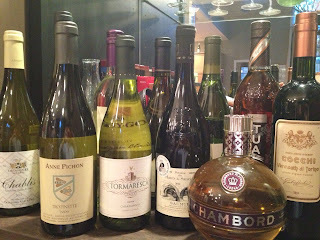 You'll notice in the picture above that the chubby round bottle of Chambord Vodka made it home with us. 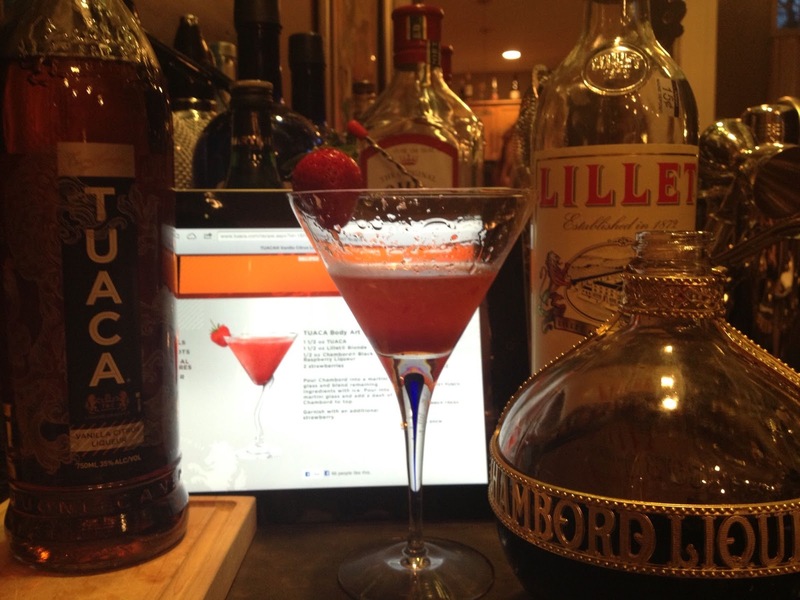 We're hard at work trying to recreate the Parisian Cosmo but we haven't found the right balance yet. There was a little too much cheek puckering with the last batch, and there's only so many you can sample before they all start to taste awesome. So it's still a work in progress. A new addition to our newly re-stocked bar is the Italian liquor Tuaca. Sounds like something you drank on spring break in Mexico, right? Wrong, it's a vanilla citrus liquor originally produced in Livorno, Italy that's now made in Kentucky. We saw it on a cocktail menu recently and weren't quite adventurous enough to try it. But with the bottle buying frenzy, we loaded it into our cart. Tuaca has a very nice vanilla taste, not too sweet and would make a good companion to any bourbon drink. I'm not a big fan of bourbon so Mr. C&G went onto their website to track down some ideas. He found the unfortunately named "TUACA Body Art", which just based on the name had no appeal to me. But the ingredients sounded good and we have a bottle of Lillet we just don't know what to do with (I think you need to be a full blooded Frenchman to appreciate Lillet), so I was game to try. My new drink was pretty tasty, the vanilla and citrus cut the bitterness of the Lillet, and the Chambord and strawberries gave it a nice color and added in some sweetness. I had to give it a new name, so because of the pretty pink color and the blades of grass poking up through the snow, I came up with the Tuaca Tulip. Sounds pretty girly, I know. But chances are if you're buying it and you're male, you'll mix it into your favorite bourbon, whisky, or rye. And that's a post for another day. Pour ingredients into a cocktail shaker filled with ice, shake, pour into a martini glass and add a dash of Chambord on the top. Garnish with a strawberry & enjoy! Hmmmm..... will you print up a cocktail menu for when I come up?? Maybe I'll have one of each! !